Looking for headache relief? You’re in the right place. 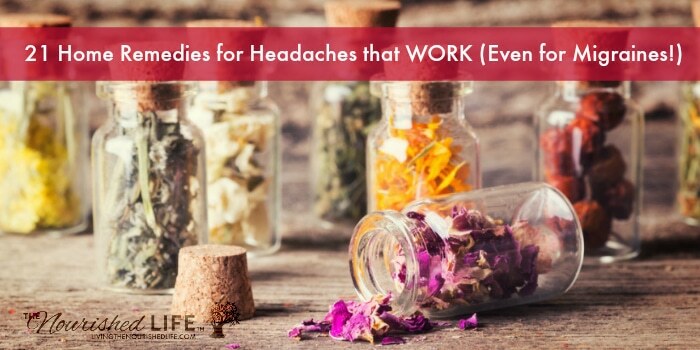 I’ve put together a list of home remedies for headaches that will help ease away the pain – and you probably already have everything you need! What is it with headaches? I have a pretty good level of pain tolerance – but never with headaches. Know what I mean? I wish you didn’t, but since you’re here – you probably do. I used to get headaches all the time. Between my husband and I, it wasn’t uncommon for us to go through a bottle or two of ibuprofen in a given month. Ugh. Changing some lifestyle habits has really made a difference (eating better, getting more sleep, staying hydrated, etc), but we still get an occasional headache. 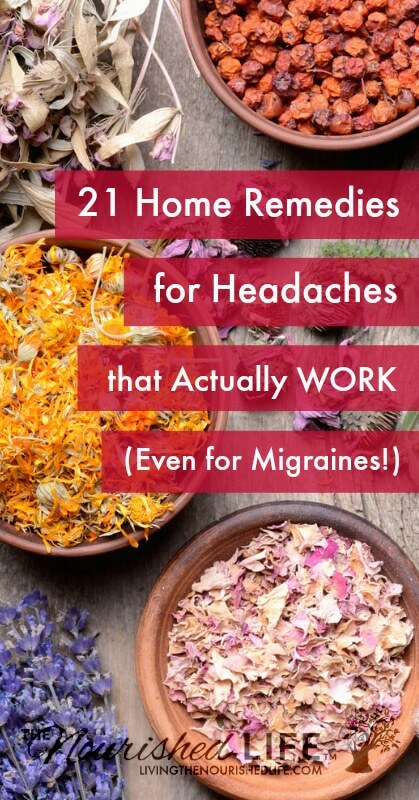 But then I started wondering – if I know a couple good home remedies for headaches, I bet my readers know a few more! After all, did you know that 18% of women experience migraines? So I asked my Facebook fans what natural remedies they use for headache relief. I knew you all would have some great suggestions. Between an overwhelming response from all of you and more research on my part, I came up with a good list of effective home remedies for migraines and headaches to share. 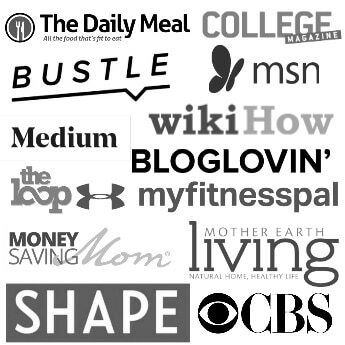 Below are some of the most popular headache relief remedies that I found. Not every remedy will work for every person, and it may help to combine more than one to really get results. Just be careful with combining herbal remedies, as you can definitely have too much of a good thing. It’s safer to combine one herbal remedy with one of the non-herbal ideas (like a bath, a nap, or a glass of water). Have a mint or drink some peppermint tea, it can really take the edge off! Peppermint is very soothing to the nerves and aids circulation. You can even place the tea bag on your forehead after you make your tea for extra relief. Known as the natural alternative to aspirin, willow bark is actually what aspirin was originally made from. It contains the pain-relieving compound salicin, and is one of the most common natural remedies for headaches. You can make a tea out of willow bark root for instant headache relief. Sometimes the best headache remedies are the things we should be doing anyway – like getting extra sleep. Ever notice how the world seems renewed after a nap? Sometimes just a simple power nap is enough for your body to reboot and squash your headache. Headaches are often a sign that you’ve gone too long without eating a balanced meal. In fact, my last headache is a good example: I’d gotten caught up in working and hadn’t eaten in a while. Next thing you know, I had a raging headache. Needless to say, I couldn’t work much after that. An ounce of prevention is definitely worth a pound of cure in this case! Eat regular meals and snacks to keep your body fueled. This increases blood flow to tissues and is shown in studies to prevent migraines. If you get debilitating headaches or migraines, getting regular acupuncture treatments can make a difference. Headaches can often be a sign of dehydration. One of the easiest natural remedies for headaches is simply drinking a glass of water. A good massage improves circulation and is obviously relaxing, and it might be just what you need to melt away that headache. In any case, we all need more excuses to get a massage! Regular massages can help if you have reoccurring headaches or migraines. In the case of occasional headaches, a neck and shoulder massage from a loved one can make a difference. Being out of alignment can definitely give you head pain. Many of my readers report that regular visits to the chiropractor can provide very effective headache and migraine relief. Usually, a chiropractor will work with you to address the root causes of your headaches, too. This herb has been used since ancient times to treat pain, including headaches. You can try feverfew capsules or tea when you feel a headache coming on. Get feverfew tea here. As with a massage, I’m always up for an excuse to take a hot shower. I always feel more relaxed and rejuvenated afterward, which goes a long way in relieving headache pain. Try using a cold pack (below) on the back of your neck while you’re in the shower or bath. The hot/cold combination can be super effective for headache relief. 11. Baltic amber necklace (milk and butter color). I don’t know much about amber, but Health, Home and Happiness wrote an excellent post on it here. If you have stubborn headaches or migraines, it’s worth a try. Not quite the same as acupuncture (no needles), one suggestion is to pinch the spot between your thumb and index finger. Gently increase pressure until there’s a dull ache, then hold until your head pain subsides. You can try this throughout the day as needed. This headache remedy is easy to combine with other ideas – try acupressure, a cup of peppermint tea, and a hot bath to attack your headache on multiple fronts. Magnesium deficiency can be the root cause behind chronic migraines and headaches. Correct the deficiency, end the migraines. Magnesium supplements (or magnesium oil) can even get rid of a headache that’s already begun as well. Learn more about magnesium here. Whether an ice pack or a cool washcloth, cold can definitely ease headache pain. The back of the neck or the forehead are the best places to apply your cold pack. Try 10 minutes on and 10 minutes off until you feel relief. The benefits of yoga include improved circulation, relaxation, healthy blood pressure, and heightened neurotransmitter levels. All of these combined make for a great headache remedy. A regular yoga practice is the perfect natural remedy for chronic headaches and migraines. Cherries contain the active compound quercetin, which is a powerful antioxidant and has strong anti-inflammatory properties. Several of my readers report that eating cherries or drinking cherry juice helps tremendously with headache pain. Let’s face it: the air inside of our homes and other buildings isn’t ideal. Fresh air is vitally important for health, as is getting adequate sunlight. A few minutes outdoors can be surprisingly refreshing, even enough to relieve your head pain. So grab a cup of herbal tea and enjoy a few minutes relaxing outdoors. This supplement (a form of the amino acid phenylalanine), naturally increases dopamine levels, which can help ease pain of all kinds. I also find DLPA helps with energy and moods. Learn more about how I use amino acid supplements here. This one sounds interesting (I haven’t yet tried it myself), and has to do with detoxing bromide from the body. I’ve heard some pretty impressive reviews about salt loading and headache relief. Read more about it here. 20. A cup of tea. Not only is a warm cup of tea relaxing, but a tea that uses herbs like peppermint or willow bark can also directly help reduce your headache pain. You can also try chamomile if you tend to have stress/tension headaches. Green tea is also especially helpful, as it contains a small amount of caffeine, which some people find helps with headaches and migraines. Hint: a peppermint/green tea combo is delicious and effective! This is more of a long-term approach to migraine remedies, but it’s by far the most effective. Certain food additives, lack of sleep, too much sitting, nutrient deficiencies – all these things can play a role in causing headaches and migraines. Make a note of when your headaches occur and see if there are any clues to what the root cause might be. Yes, they really do! But not every remedy will work for every headache. Headaches and migraines are stubborn and complex. That’s why I emphasize getting to the root cause of your headache. It can help to combine a few remedies, and try something new if something else isn’t working. It also really helps to eat regularly, stay hydrated, get enough sleep, and do deep breathing exercises or meditation regularly to lower stress levels. Healthy habits can prevent a lot of headaches (quite literally). To be honest, serious chronic migraines are difficult to treat. These natural remedies will probably be most effective if you use them right away when you feel a migraine coming on. Work with a health professional to develop a plan for long-term migraine treatment and find out how you can include natural remedies in that approach. Absolutely! I used to get a pounding headache every time I was overwhelmed with stress. Make priorities to lower stress in your life if you can. But let’s be honest: there’s a lot of stress we can’t do anything about. In that case, healthy habits are all the more important. I know I’m repeating myself – but eat well, stay hydrated, get some sleep, and meditate when you can. These all lower the impact of stress on your body. Some women experience more headaches in the week before their period. The headaches remedies in this post can definitely help, but it can also be helpful to have your hormone levels checked and try some natural remedies specifically targeted toward PMS (because PMS is usually associated with an underlying hormonal imbalace, usually of estrogen, progesterone, and/or testosterone). Ginger works too! It blocks the protoglandins that cause pain and inflammation in the blood vessels of the brain. Take 1/3 tsp either fresh or powdered when you feel a headache coming on. Migraines have also been linked to a deficiency in vitamin B-12 (as have ADD and Anxiety disorders, so if you deal with the trifecta as I once did this may be exactly what is missing). Taking sublingual tablets or drops of B-12 is more effective than pills that you swallow, as the sublingual tabs go directly into your bloodstream via the capillaries under your tongue. 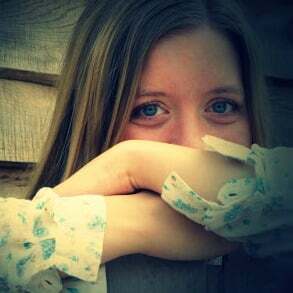 Once I made B-12 supplements a daily thing for me, migraines became a thing of the past. Red meat is an excellent source of B12 as well. I know the official scuttlebutt is that it’s dangerous, but they say the same about saturated fat and they’re not right about that either. Yes, raw milk, liver and grass-fed beef are all great natural sources of bioavailable vitamin B12. Said this already on the Facebook page but if there’s a chance you’re deficient in magnesium, and you like hot baths, take a hot bath with Epsom salts in it. They contain magnesium, and you can absorb it through your skin, and I daresay that’ll work faster than popping a magnesium pill. I agree that magnesium supplements are a secondary choice, though some may find them more convenient. Epsom salt baths are great for general health and wellness in addition to correcting magnesium deficiencies. Also great for kids, too. You can also buy magnesium flakes, and I believe those have a higher concentration of magnesium and in a different form than Epsom salts. True. I’ve been meaning to experiment with magnesium chloride flakes myself. From what I understand, magnesium chloride is better for absorbing magnesium, while Epsom salts are useful for detoxification. Do you have an alternative for those who cannot take baths due to health reasons? I would look into magnesium oil spray, that might be a good alternative to a magnesium bath. Oil spray is not strong enough. In my experience you must take it twice a day, glycinate form. Or you can get injections. See your doc. Good to note. I think it definitely depends on the severity. Magnesium glycinate can be very helpful. The one thing that seems to reliably relieve my migraines is drinking a cup of roasted chicory with raw milk. One or two cups either knocks out the migraine altogether or reduces the pain enough for me to function again. I’ve never seen anyone mention this as a potential migraine remedy, so thought I’d mention it in case it works for someone else. Great tip! Love to hear about remedies that work. 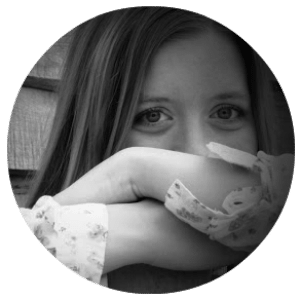 rhonda – what triggers your migraines? my worst ones are weather related, they can last over 24 hours. i’ve been med free for nearly 2 years, including ibuprofen, tylenol (except once for high fever). i found that the maxalt while it made my migraine pain better, it gave me rebound headaches, so i’d suffer less day one, but then be in a fog with headpressure for up to a week. chiropractic adjustments and very clean diet has helped me nix most headaches, but i still get whopper migraines with weather changes. i’d love to find something to make weather migraines tolerable. I get those too… oh boy do those hurt. I have had great success with peppermint teas, my husband giving me a massage (feet, head, neck) the goal is for me to relax so I’m not tense and making it worse, and warms baths with aromatherapy oils. A really valuable tool I learned is to put bare feet on the warth for half hour per day. Alternatives to bare feet are grounding shoes (without insulating rubber or other materials) or grounding mats. Walking barefoot is excellent and you get the added benefit of accuprrssure on your feet. It is the magnetic connection to the earth that helps. It’s science, not just a hippie remedy! just wondering who your chiropractor Is ??. I might give him a call . I’ve been using manual trigger point therapy from My chiropractor and for the first few years it really helped I didn’t have to take any meds for years maybe occasionally. But now my headacheS Are back like the way it was when I started to go to him . I’ve tried that Rhonda, it doesn’t even touch the side of my migraines. Are you diagnosed with migraine? Or just having bad headaches. Two totally different things. Many migraines can not be stopped by raw milk and chicory. There is no evidence about ginger either, but it works better as an anti-inflammatory – already mentioned here. Lying down with a warm wheat or flax bag placed on the face or back of neck helps me. Feverfew is excellent, even when migraine is caused by solvents. Never gets past the sparkly aura. Good enough to be able to drive within about 15-20 minutes so it never incapacitates. Has also worked for abdominal migraine from which another family member suffers. Dehydration seems to be one of the triggers for her. Lavender oil is also good for relieving headache pain. Rub a small amount on temples and outer brows (be careful you don’t get any in your eyes!). Also a warm bath with a few drop of Lavender oil + chamomile oil will help you relax if you have a tension headache. Believe it or not, I’ve found a few minutes of gentle bouncing on my rebounder will get rid of a headache. I don’t get bad headaches, though, so I don’t know if this would be a good idea for a headache that is ibuprofen material. Thanks for all the suggestions!! I’d love to get my husband and I off our ibuprofen reliance! The single biggest improvement to my migraines came from eliminating packaged foods from my diet. I believe the main aggravator was MSG, and I have not used a canned soup or broth product in a year and a half. When I cut out canned broth and started using homemade exclusively, I went from 1-2 migraines a week to going over 2 months without one. Now, I only get migraines when there is a huge change in the weather, or else when I don’t pay careful attention to what I eat. Even my husband and (of all the miracles) my mother are in on it. My husband will even talk me out of getting fast food on the rare occasions I crave it, even though he wants it himself, because he knows it will cause me a migraine. have you found anything that helps dull the weather migraine pain? You can also try ginger for headaches and migranes. The tea everyday to prevent and chewing fresh ginger during the pain. Most of my headaches come from weather changes. I try to get by without taking any medicine, but sometimes if I put it off, then the headache is worse. Sometimes the only thing to get rid of it is sleeping. Thanks for the post! Just last night oldest dd had a headache (she never does so may be coming down with something). She ate; didn’t go away. We did the peppermint oil which helped but it didn’t go away so about 30 minutes later and after 3+ hours of headache she gave in and took an advil (again – never does). Now I have more things to try thanks to you and the comments. Thanks all! i like the excuse to eat more cherries! how much cherry juice does it take to knock out a headache? I’m not sure. I would probably start with a few ounces and then drink more as needed.